The Mount Baker Secondary Wild Junior Girls basketball team are a special group this year. Over the weekend at a tournament in Okotoks, Alberta, the girls steamrolled their opponents, beating Foothills High School 59-23, Holy Trinity 84-11 and Chestermere 90-24. Every single player on their roster picked up at least a basket as they reached new season highs in scoring. Speaking to the Townsman last week, head coach Dan Loewen said the team has a road map to be very competitive at the B.C. Provincial tournament in late February and are improving each week. In three tournaments before the Christmas break — all in Calgary — the Wild picked up first, second and third place finishes. Wherever they go, they have one big advantage. As opposed to their Junior male counterparts, the MBSS girls have the combination of size and skill. All they need now, is more practice and game-time. “We’re a little inconsistent right now, though we’re getting a little bit better,” Loewen said. “We’re trying to increase our guard depth and that’s taking a bit of time. Most of the kids are starting to come along [and], overall, they work hard in practice. Led over the weekend by U-15 Team BC’s Kiara Ker, who averaged 16.3 points per game at the tourney, as well as Summer Blackmore (11.3 ppg), Taliya Stepan (10 ppg) and Kali Ewaskow (20 rebounds), the team plays in Jaffray this upcoming weekend before heading out to a big competition in Kelowna. “[That] will be a tournament we’re trying to peak for,” Loewen said of the Kelowna weekend. “It’s a 16 team tournament with at least four teams ranked in the top 15 [teams in the province] in it: Summerland is pretty good; Penticton is up there; [and] Vernon is supposed to be very good. While the coach has some concerns that the team will not reach their maximum potential this year, he already knows that his group can keep up with anyone. “If we were in Calgary, we’d probably be the fourth or fifth-ranked team in the city at this level, which I think is pretty good for these kids,” he said. “Lower mainland teams, [especially in the] Fraser Valley, are very, very good. I see basically two teams in Calgary that would be [near] that level. Practicing four days a week and only having one weekend off before provincials, the Wild are definitely a hardworking bunch. On February 16 and 17, they’ll have a chance to show off in front of the community, as they host a home tournament. A mix of local schools, including Grand Forks and Castlegar, are making the drive over, and Loewen is expecting a very fun weekend with plenty of reasons for Cranbrook basketball fans to come down to MBSS. “[Our] team has a whole pile of kids that are going to be future post-secondary players, [and] they’re a fun, exciting team to watch,” he said. “They do some pretty cool, innovative things. Every player brings something special to the team. 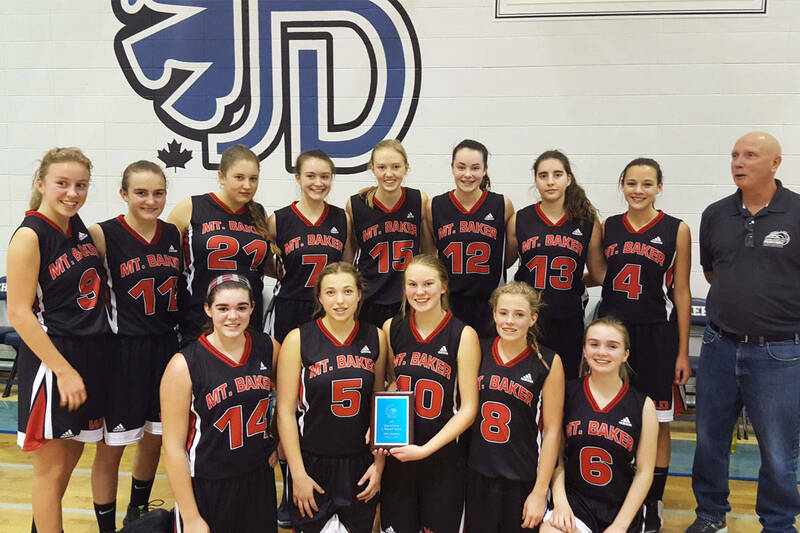 In addition to the Junior Girls success in Okotoks this weekend, the Mount Baker Senior Girls went to Chinook High School in Lethbridge and went 1-2 and the Senior Boys earned a silver medal in Creston, only losing to the host team due to a wild buzzer beater from close to half court. The provincial tournament for the Junior Girls will be held in Langley from February 28 to March 3. The team kick off their Jaffray tournament against Kimberley’s Selkirk Secondary at 3:00 p.m. on Friday afternoon.